He may have set a new British record en route to the 200m individual medley final but there will be no chance of Max Litchfield losing focus with a podium finish now in his sights. Fourth over the 400m individual medley on his Olympic debut in Rio last summer, it could have been argued that Wednesday’s shorter 200m event was an ideal warm up for the Sheffield swimmer for his favoured event on Sunday. Instead Litchfield has put himself firmly in the mix for a medal earlier than predicted on his World Championship debut after a series of impressive performances at Budapest’s Duna Arena. The 22-year-old smashed his lifetime best in the heats by almost a second and a half, touching in a time of 1:56.64. That not only broke the previous British record held by James Goddard since 2009 but would have also been good enough for bronze at last year’s Olympic Games. He then almost mirrored that time in the semi-final, going just 0.06 seconds slower to qualify third fastest for today’s medal race. “I’ve not really done the 200m IM before at a senior major international before so to go and do that is fantastic,” he said. “I don’t really know what to say to be honest. I just wanted to hit the first race hard and get in there. To get the British record as well is amazing. “My dad is out here so he rang me this morning after my race to congratulate me but it was a case of just trying to switch off from it and focus on the race. “I just wanted to swim the same race in the semi-final, I knew it would be good enough to get through and I did it almost exactly the same. “That was the goal just to get through the final, I’ve done that and now it’s just about refocusing for tomorrow. “We are always trying to move forward, thankfully I’ve been able to do that since Rio. I’ve been working hard every day and thankfully it’s paying off. Litchfield will have to lower his time again if he wants to challenge for the title with American Chase Kalisz qualifying fastest in 1:55.88 and Japan’s Kosuke Hagino second in 1:56.04 – 0.66 faster than the Brit. 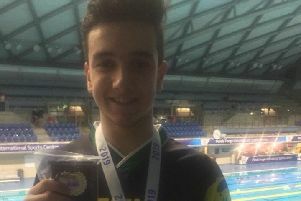 But the City of Sheffield swimmer is not afraid to mix it with the world’s best, as seen with his Olympic debut last year, and he was not talking down his chances for the 200m medley. “It’s going to be dog fight on the last 50, but I know I’m strong there so if I can get in the right place at 150m, then I can put on the afterburners and hopefully get in there with a medal,” he added.